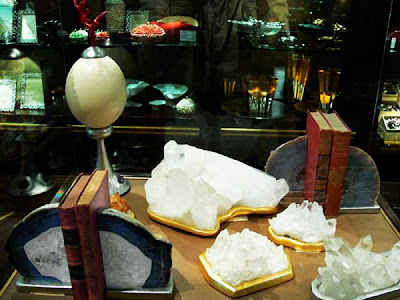 For those of you who have lived in Atlanta for a while, you might remember a store named Geode which sold, well, geodes. 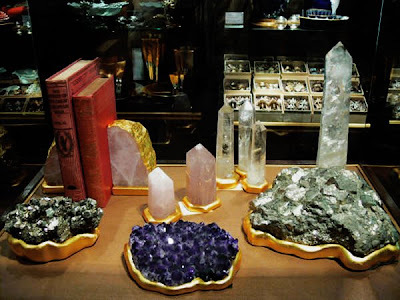 I remember walking by Geode as a child (it was, interestingly enough, located at a mall) and being mesmerized by the displays of colorful crystals and minerals. They were so shiny, so mysterious, and so flashy. OK, so the insides of the geodes were flashy; the exteriors, not so much. Perhaps it's this early childhood fascination with quartz and stones that explains why the stuff is like catnip to me. And perhaps it's why I was excited to be introduced to the work of Eduardo Garza. Eduardo creates sculptural pieces made from not only stones and minerals- my favorite- but also wood, eggs, and shells. (Van Day Truex always said that in design, Mother Nature is our best teacher, and Eduardo's work is testament to this.) His pieces, all hand made and sold as signed, limited editions, have caught the eye of both Bergdorf Goodman and Harrods, where his work is featured in the vignettes seen at top. In addition to being sold through both department stores, Eduardo's pieces are also available through his website. 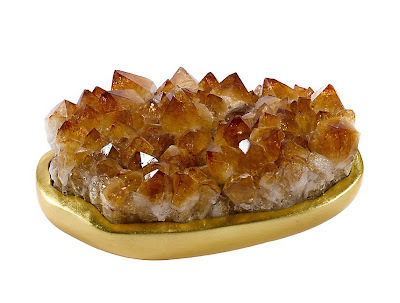 Citrine mounted on a gold leaf base. 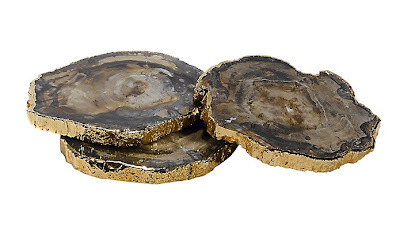 Far more luxe than the geodes of my childhood. 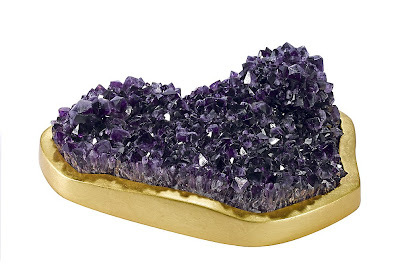 For those taken with purple, there is Amethyst mounted on a gold leaf base. 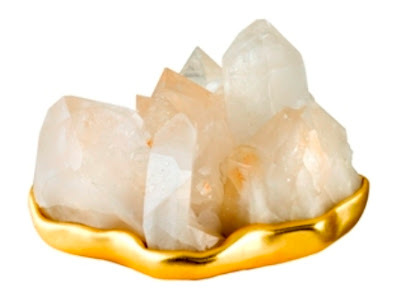 Rock Crystal on a gold base. Not all of Eduardo's work incorporates stones and wood. 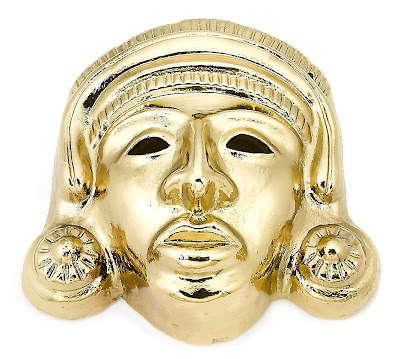 This handmade mask is dipped in gold. 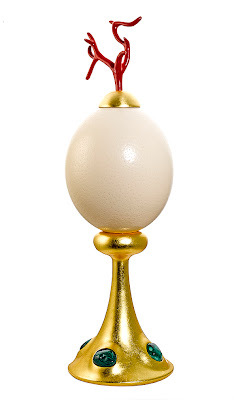 The ostrich egg piece at top is perched on a gold leaf and malachite base with a finial handmade by Eduardo. 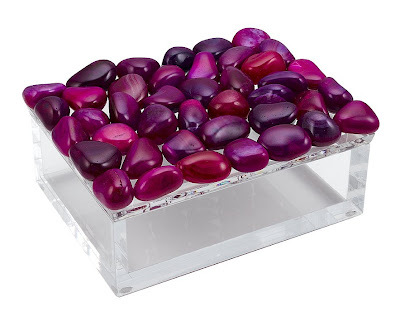 A certain designer with the initials "AH" (and a man who is also my idol) used this piece on his designer table at the Lenox Hill Neighborhood House Gala. 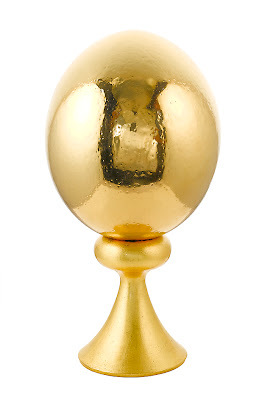 The smaller egg at bottom is an ostrich egg dipped in gold. Eduardo also works with anodized aluminum. 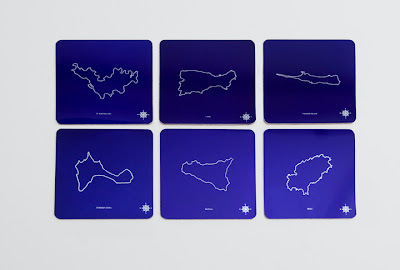 I think the island coaster series is fun. 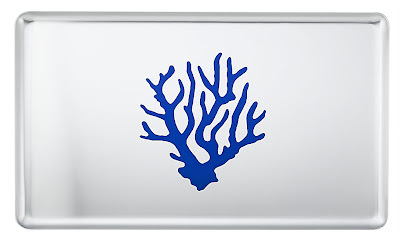 The coral tray is a different take on the classic ocean motif. 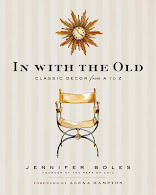 When I started my blog almost three years ago, I intended to write a great deal about design history. One reason was because I've long had an interest in it, but I also have always found inspiration in these rooms of the past. If you study the details, sometimes you might just get a few ideas for your own home. 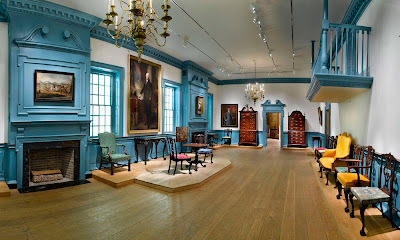 I was recently studying the American period rooms in the American Wing at the Met (all online if you'd like to take a look), and I was struck by how modern many of the colors and furnishings are. Actually, perhaps I shouldn't say it's modern because the rooms' details are historically accurate. Rather, they still seem to appeal to these modern eyes. The Hewlett Room, c. 1740-60, Woodbury, Long Island. What immediately strikes me is the intense, gorgeous blue walls. It looks a lot like the blues being used by designers today. 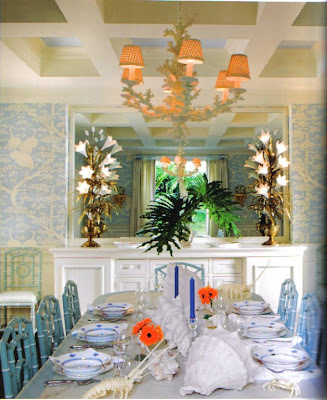 The blue paint color plus the orangey, coral shade of the china cabinet reminds me of that Kendall Wilkinson showhouse room from a few years back (see below). The other detail that I might keep in mind for future use? The nailshead trim on the baby's crib. Wouldn't that scroll design look great on a screen? 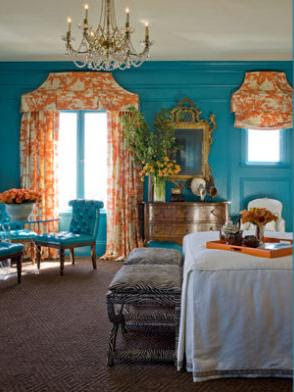 Kendall Wilkinson's showhouse room is somewhat similar in color scheme to that of the Hewlett Room. The Alexandria Ballroom, 1793, Alexandria, Virginia. Again, it's all about that beautiful blue. 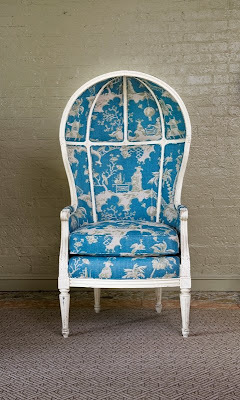 Still so chic today, and doesn't it look like a color that Steven Gambrel would use? 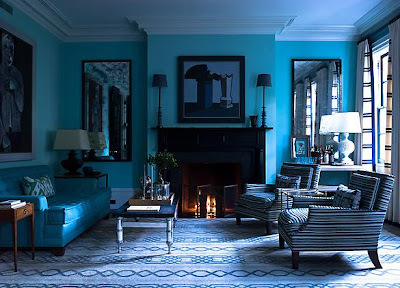 A bright blue Greenwich living room by Steven Gambrel. The Haverhill Room, c. 1805, Haverhill, Massachusetts. On first glance, it would be easy to dismiss this room as too old, too early American, and too fancy. But look closely. 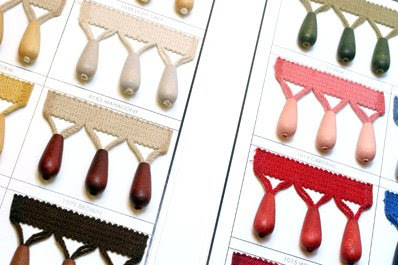 The trim on the bed curtains would look fantastic on curtains or pillows. 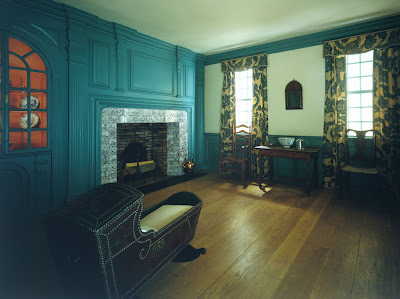 Samuel Hart Room, c. 1680, Ipswich, Massachusetts. To some, the focal point of this room might be the oak timbers. To me, it's the bed. 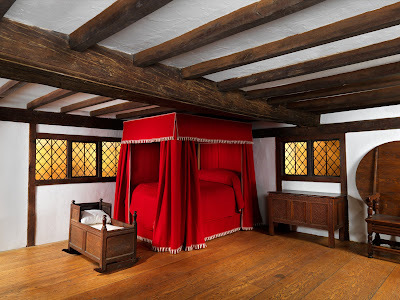 (Interesting to see the somewhat diminutive scale of this bed; people were smaller back then.) 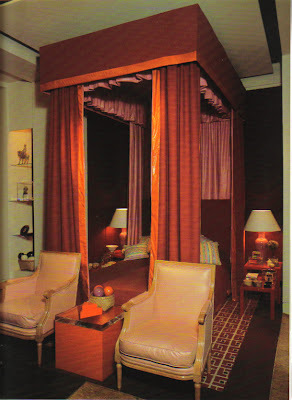 I would use more feminine fabric and trim, but the lines of the bed curtains are still appropriate for today. 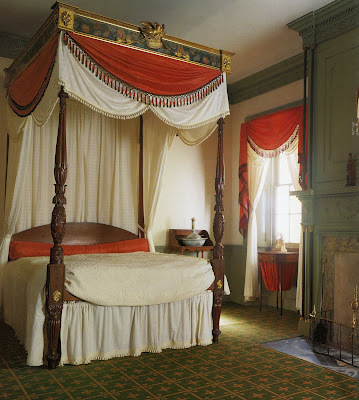 David Hicks designed a similar bed centuries later, though obviously the fabrics and the proportions were far different. 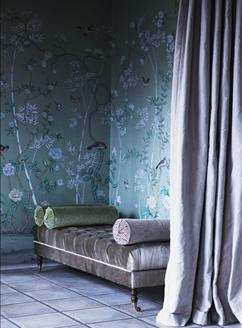 As of late, some of the most popular handpainted wallpapers seem to be those bird, flower, and tree prints by de Gournay (see above) and Gracie. Certainly they are lovely, easy to live with, and quite elegant too. And if someone wanted to make a donation of this paper to my home, I would not refuse. However, what I wish to see more of is the colorful, exuberant scenic Chinese paper that once adorned some of America's finest homes. 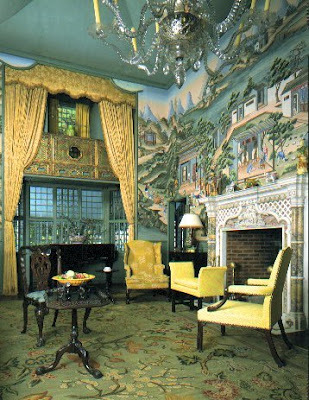 Of course Winterthur's Chinese Parlor is one of the most famous rooms in America. The Chinese paper was painted between 1775 and 1800 is known as "Pastimes and Leisure Scenes of Chinese Life" because it depicts scenes of Chinese people strolling through gardens and studying. 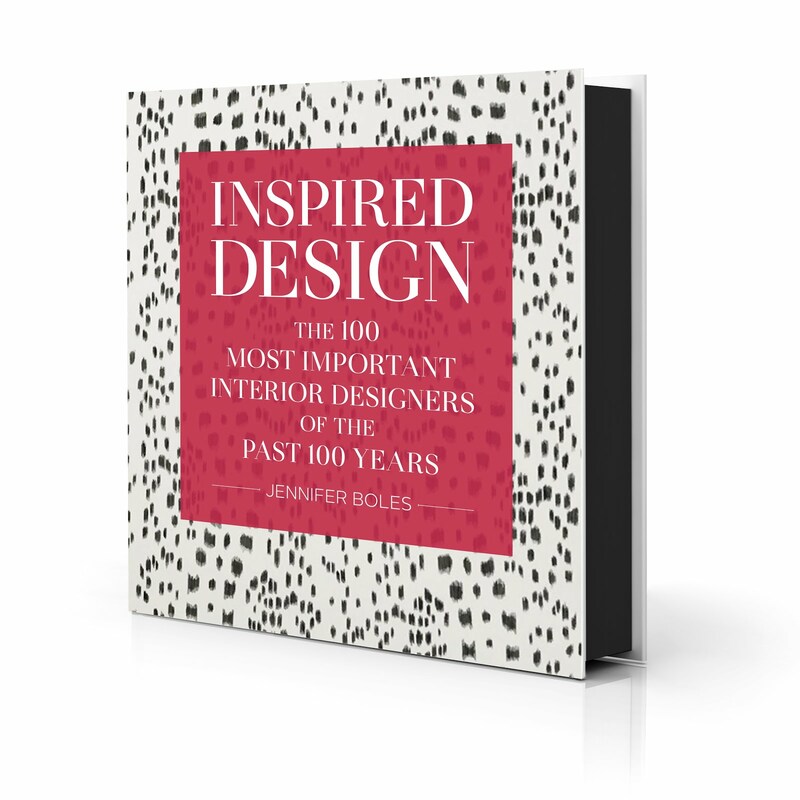 Henry Francis Du Pont obtained the paper from designer Nancy McClelland in 1928. Because the paper panels were 12 feet long, Du Pont had to create a room tall enough to accommodate the paper's length. 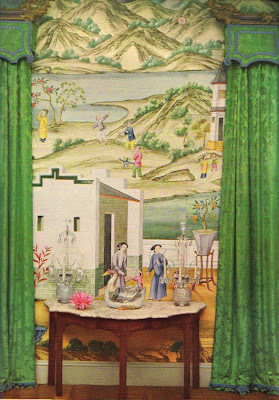 A detail of the Chinese Parlor's paper. Henry Davis Sleeper purchased this scenic paper in the early 20th century for his summer home Beauport. In what is called The China Trade Room, the paper depicts both the rice and the porcelain trades. The paper dates back to late 18th century when it was originally imported from China by the Philadelphia banker Robert Morris, although Morris never used the panels. The paper remained crated until it was discovered in the early 1900s. 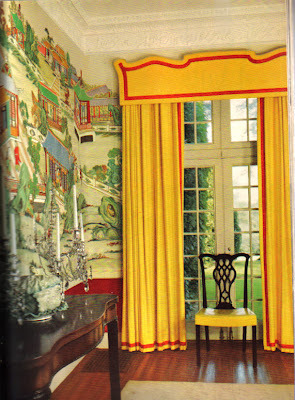 Even Billy Baldwin had an appreciation for this paper in this 1950s era room that he designed. 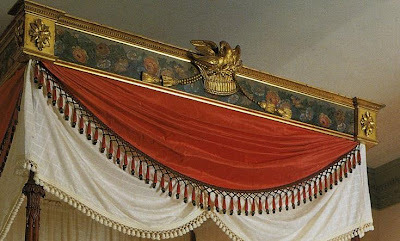 What I've also noticed is that gloriously unrestrained architectural details and valances seem to go hand in hand with this colorful Chinese paper. There is often fretwork molding, pagoda pediments over doorways and windows, and scrolled pelmets that decorate these Chinese themed rooms. 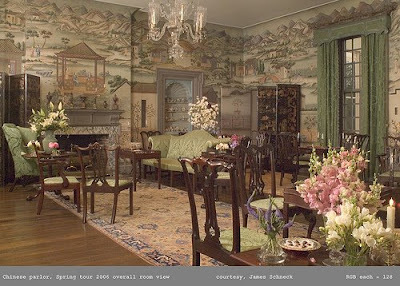 Unfortunately, papering an entire room in scenic wallpaper can be rather expensive, and some people might be apprehensive about having that much color and pattern on one's walls. However, what about framing a panel or two to hang on the walls? At the very least, I might be tempted to copy some of those wonderful valances for my windows. Decorating with luxury good logos is something that divides people into two camps. To some, it's quite chic, while to others it's nothing short of declassé. For the record, I tend to avoid logos in my rooms, but I also think that if surrounding yourself with "LV"s makes you happy, then by all means knock yourself out. A few Hermès boxes tucked discreetly into a bookshelf provide a nice pop of rich orange. And for the record, I'm guilty of this decorating virtue or vice, depending on which side of the fence you're on. And of course we can't forget about Louis. The market for vintage Vuitton trunks and suitcases is always hot, especially when decorators like Miles Redd incorporate them into interiors. Louis Vuitton bedecked dressing room doors courtesy of Nicky Haslam. Now let me just say that I'm a fan of both Haslam's interiors and his acerbic tongue. He really tells it like it is, and that's pretty refreshing. I'm just not sure that I could face living with Louis' initials on a daily basis. Now if those doors were covered with Hermès leather (no logo mind you, just plain leather), that would be divine. It's hot here. Oppressively hot. Oh, and humid too. So muggy that all I want to do is lie prostrate on the sofa. I can't get interested in design today, nor entertaining...nor really anything else. But in my humidity induced stupor I did muster the strength to look through my Horst: Interiors , and I found one photo that seemed to bring the temperature down a notch or two. 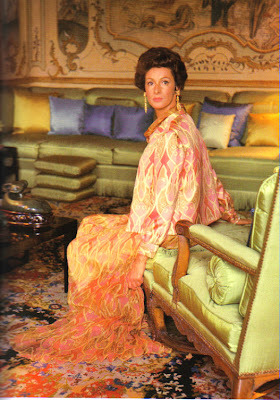 That's Marella Agnelli looking at Horst's camera with an air of sangfroid. The breezy Pucci chiffon gown would be perfect in the Atlanta heat, though I'd have to ditch the jacket as chic as it may be. But what I'm taken with is that pale pea green silk banquette. What a cool, crisp sofa on which to lounge in the stifling heat. And the colors are so soothing- greens, blues, and pale yellows. Of course, the rug is a little heavy to look at right now, but the rest of the room makes me feel cool as a cucumber. And now it's time to go back to my nap. Last week I had the opportunity to visit the Jerry Pair Showroom and view No. 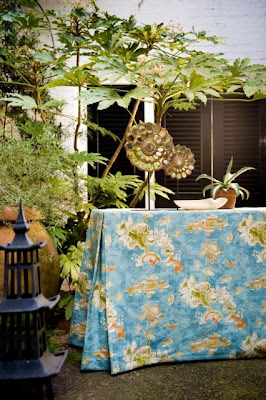 9 Thompson's new fabric collection, The Orientaliste Collection. For those of you who might not be familiar with No. 9 Thompson (and truth be told I really wasn't until last week), it's the more current, more relaxed, and moderately priced line offered by Jim Thompson. Richard Smith, designer of the line, and Chad Holman,Vice President of Jim Thompson, walked me through the new collection, and I can't tell you how impressed I was. Inspired by the Far East, Smith took classic Chinoiserie patterns and motifs and transformed them into something so fresh and so unique. 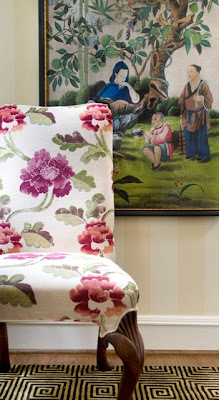 There is a classic toile, florals, abstracts, and stripes, but each print has a twist: a stripe is given subtly wavy lines; a peony has ever so slightly metallic leaves; and a traditional porcelain print is rendered in a graphic way. And many of the prints have a painterly quality to them, not surprising as Smith is an artist who paints many of his designs first before taking them to Thailand to be woven. There are so many great things about this line. The colors are so rich, vibrant, and yummy. The fabrics mix well together- and with those from other lines too. And despite the fact that the fabric is well made and looks expensive, it's actually so affordable. (Many of these fabrics cost less than what you find at discount fabric stores.) Anyway, I could go on and on, but I won't. I'll let the photos do the talking for me. "China Lilly" is a print of lilies and clouds conceived and painted by Smith. "Fretwork" is the most beautiful printed linen. That golden yellow colorway almost made me faint- and I usually am not a fan of yellow. "Hexastripe" was based on the shapes of Chinese paving stones. The colors are amazing. I'm crazy for this print. The peonies of "Kesi" were inspired by those in an antique Chinese tapestry. Some of the leaves have a metallic overprinting to them- subtle but still so chic. "Nanking" is a far cry from the traditional porcelain prints favored by Nancy Lancaster, but the fresh, graphic look of it just might win over a new audience. "Puwen", the Chinese word for striped fabric, has a herringbone weave. "Tea Party", a print that I think will have a lot of fans. "Treillage" is a linen weave. The colors are so much more rich in person than in my amateur photograph. "Yangtze" is the print with the undulating stripes. 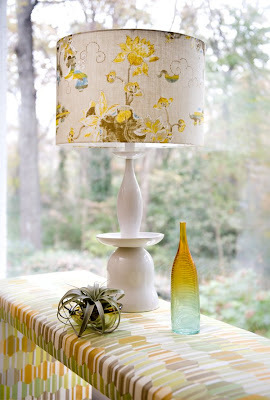 Image at top: "Hexastripe" on the console and "China Lilly" on the shade. The professional photographs are courtesy of David Christensen. The photos with the bad lighting...courtesy of me.